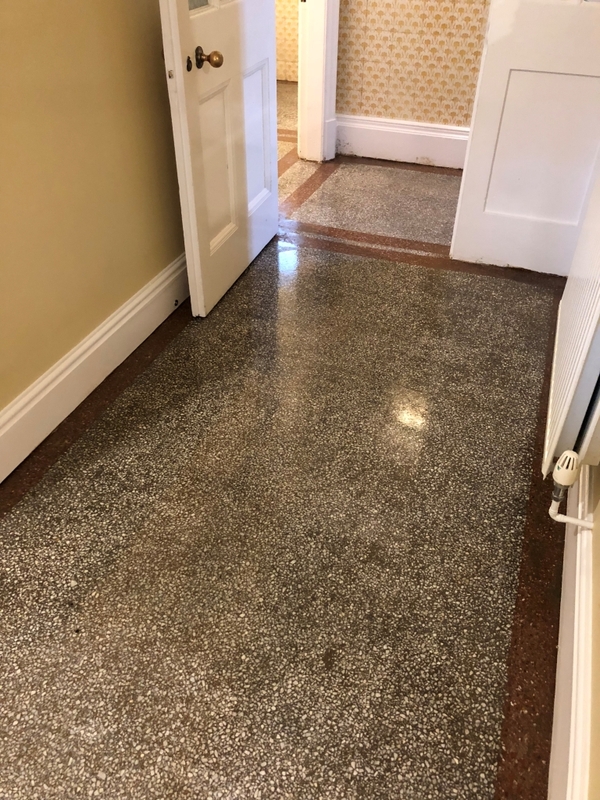 The owner of an older property in Newmarket got in contact with us about restoring his Victorian Terrazzo Tiled Hallway. 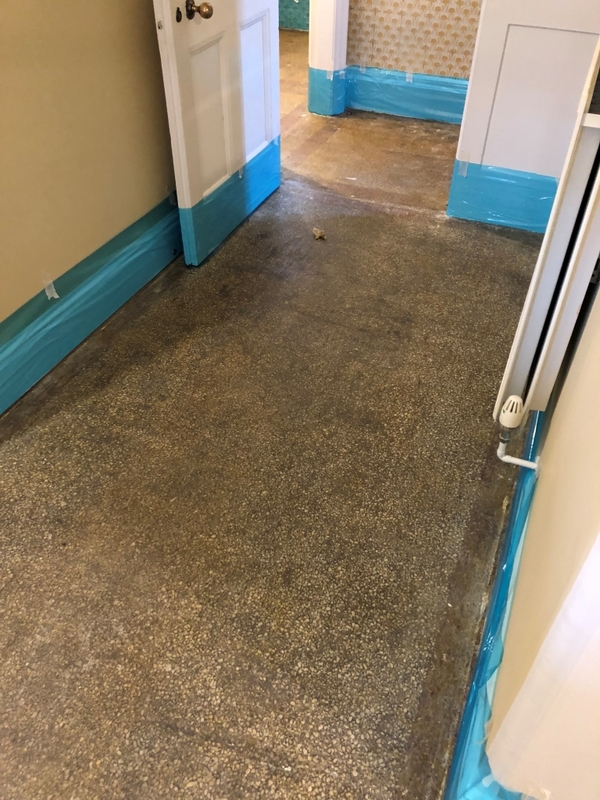 We like to do a site survey to ascertain the condition of the floor and give the client a fixed price for the works, so we organised a time to pop over and look at the floor. The floor had taken a battering over the years and was completely unrecognisable after being completely covered up with carpet that had been secured in place with a lot of adhesive. 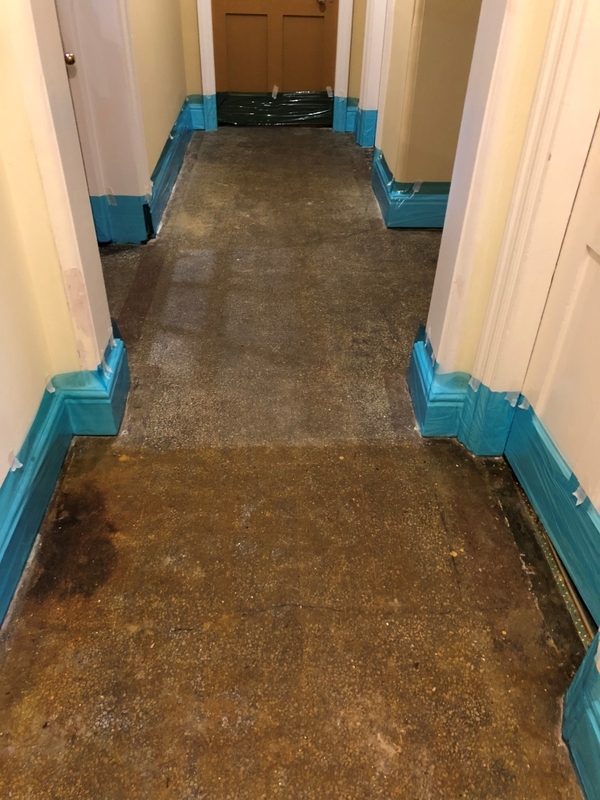 Removing the glue and restoring an old floor like this is a difficult task but something we are familiar with and we were confident it could be restored to a reasonable standard. We discussed with the client the process and agreed a price to carry out the restoration. The first day consisted of adding protection to the wooden skirting and then carefully scraping off as much excess adhesive as possible. To remove the rest of the glue a thick coat of Tile Doctor Nano Tech HBU remover was applied. I had tried applying this product on the floor first, but it struggled to make any impact given the huge amount of adhesive that was present. Incidentally HBU stands for Heavy Build-Up which pretty much described the problem with the floor. I left the HBU to dwell for about fifteen minutes, scrubbed it in and then rinsed off the soil with water and extracted with a wet vacuum. To finish the job, I then repeated the process with a coat of Tile Doctor Remove and Go which was scrubbed it in to the floor to release the last bits of adhesive. Again, the floor was rinsed with water and the soil extracted with a wet vacuum. The floor was then inspected to ensure all the adhesive had been removed and stubborn areas were spot treated using a mixture of techniques until I was happy. Removing the adhesive was hard work and took up the whole of the first day but was well worth the effort as the Terrazzo was now visible and the end goal was in sight. 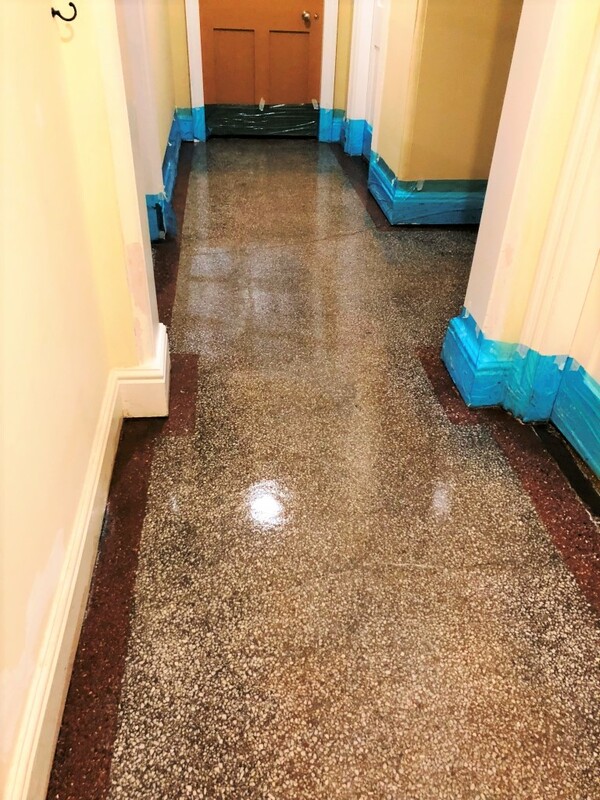 So, returning the next day we proceeded to build on the restoration by honing and polishing the Terrazzo with 100 through to 3000-grit diamond encrusted burnishing pads. They are applied in sequence i.e. 100, 200, 400, 800, 1500 and finally 3000 grit, using water to lubricate and then more rinsing and extracting between each pad. 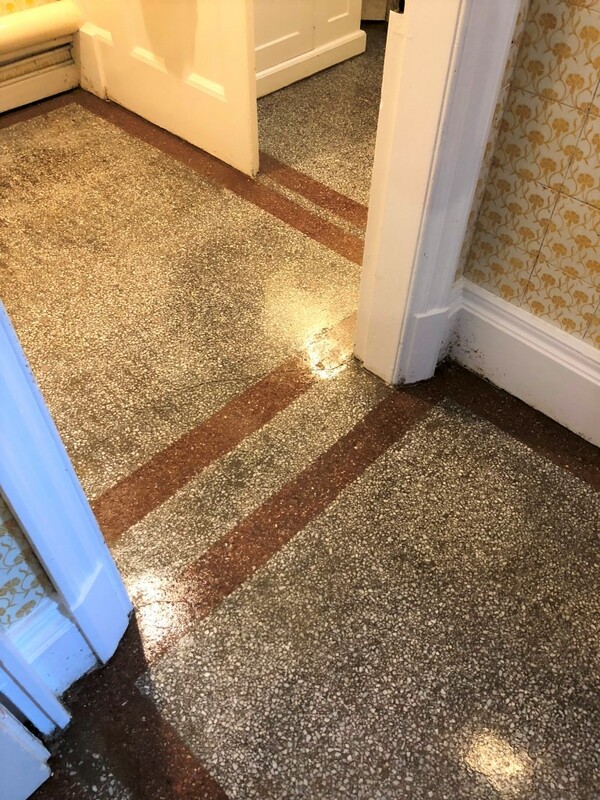 With the glue was removed and the Terrazzo renovated a large crack was clearly visible across part of the hallway floor, whilst it’s not possible to repair this without taking up the floor I was able to improve its’ appearance by applying a matching filler to the cracks whilst the floor dried. The final stage was the application of an impregnating sealer. We selected to use Tile Doctor Colour Grow which is a colour enhancing product that soaks into the pores of the stone protecting it from within. It had been some time since the Terrazzo had been sealed so it took more coats then usual to properly seal the floor.